I was included in the Ladysmith Waterfront Art Gallery for their annual Multimedia Fall Show. The exhibition will run from October 1st until October 30th, 2011. 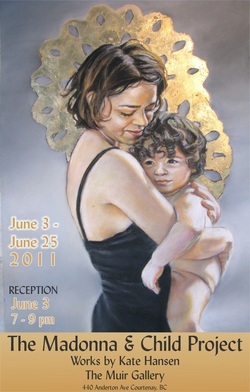 The full Madonna and Child Project, complete with birth stories, displayed at the Muir Gallery in Courtenay BC. June 3- 25, 2011. Here are some photos of the opening reception! I participated in a group show in honour of earth hour at Gallery 1313 in Toronto. Curated by gallery director Phil Anderson the exhibition explored the issues and concerns of the environment including issues of urban sprawl, buying and eating locally, air and water quality, energy conservation, clean and renewable energy, global warming and other environmental concerns. March 16-27, 2011. I won an award for Figurative Realism at the Comox Valley Art Gallery members show and sale. The exhibition ran from March 5th until April 15th, 2011. I had my first solo showing of the Madonna and Child project at the Fifth Parallel Gallery in Regina, SK. The closing reception was January 14th from 5:00pm until 7:00pm. I participated in a group show called "Mothers" at Chicago's Woman Made Gallery. Here is the opening night. I won "Most Innovative Portrait" at The Canadian Institute of Portrait Artists National Exhibition at Mount Royal Univeristy in Calgary. My portrait "Ailen and Jet Jazz" was chosen from among thrity nine participating artists. The exhibition is being held at the upper floor gallery of the Bissett School of business, and runs from September 21st, until October 30th, 2010.